Not too long ago Sightmark, the company that makes the Photon XT night vision scope, announced the Photon RT series. This newer series replaces the XT. However, you can still find the XT for sale online. Find out whether it’s a good idea to get an XT or whether you should go for the Photon RT. 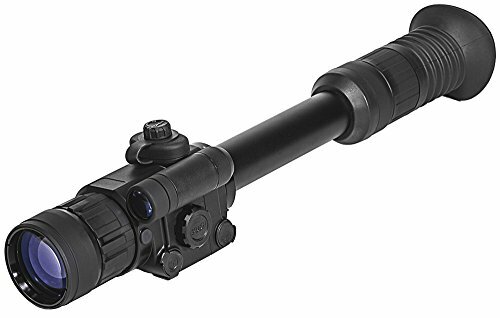 ​The RT, as mentioned, is supposed to replace the Photon XT which has been around for a while and is one of the most sought after night vision scopes today. Not only does it offer great performance but is also very affordable. Not too many years ago it was seemingly out of reach for the ‘normal’ hunter to be able to afford a NV rifle scope. Yet, the XT and some other scopes have brought the technology within reach of nearly everybody that wants to shoot at night. ​Click here NOW for more information! Today you can get two different types of night vision. First, is the traditional night vision which is also sometimes referred to as generational night vision. The name pretty much says it all. It’s not a digital variant and as such relies on mechanical and optical elements to produce an image at night. This type of NV has been around for decades and has seem major improvements over the years. Yet, as it is based on mechanical and optical elements, it also is rather expensive. It uses a specific tube to intensify the light to form an image. The tube is called ‘image intensification tube’, IIT. The tube itself consists of a few components to produce an image at night time. First, there’s a photocathode which takes the light that passed from the lens and converts the photons in the ambient light into electrons. These electrons then accelerate through a vacuum section of the tube onto a microchannel plate. This plate basically has a tremendous amount of tiny holes through which the electrons go through. At the other end the electrons are then hitting a phosphor screen that turns them back to photons and makes them visible. This is then the image you can see when looking through the scope at night. These types of night vision devices are separated into three different generations. Generation 1 is the cheapest while generation 3 is the most expensive and can run up to several thousands of dollars in cost. As you’d expect, the image quality and range of a Gen3 NV scope outperforms a Gen1 NV scope by leaps and bounds. As with nearly ever area of our lives, digitization has also reached the night vision sector. There are more and more digital night vision scopes available and they produce better images with longer ranges at lower cost. A digital NV works not much different from your digital camera. A light sensitive component, a CMOS, is the central part of it. The light hits the CMOS which converts it into electrical signals that you can look at on a screen. This technology is undergoing constant improvements and at this time you can expect quality of a good digital NV scope to match a Gen2 traditional NV sight. The main advantage is that the digital variant is cheaper! A downside of all digital night vision scopes is that they rely on an artificial light source in complete darkness. In most cases that’s an infrared light which is integrated into the NV scope. The Sightmark Photon XT is such a digital NV scope. The result is a great sight for a rather low price that’s sufficient for many if not most shots you’ll take during the night. It uses two AA batteries and is expected to have a runtime of around 4 hours when the IR emitter is used. Without the IR emitter you can expect a runtime on the batteries of around 5 hours. The screen resolution of the display on the XT is 640x480 pixels. They are set in a 4:3 format which is the old TV screen layout. The screen is not the best you could imagine but is good and workable for an affordable NV scope. Another factor on figuring out the quality of a NV sight is the effective range. The Photon XT 4.6x42S has a maximum effective range for 130 yards. The field of view at 100 yards is a good 22.5 feet. You can expect to get a good image at that range but it will quickly get worse if you try to target anything beyond that range. You can hook up the Sightmark Phonon XT to a video (recording) device as it has a video out connector. You can for example use a commonly available RCA cable to connect the scope to a monitor to view the image on the monitor. Windage and elevation can be adjusted by 25mm at 100 yards for each click. They can overall be adjusted by 60 clicks. Considering the effective range of 130 yards, it’s a sufficient range that is provided. The magnification is fixed at 4.6x. This is a reasonable magnification range when shooting out to 100 to 150 yards. Compared to traditional scopes, you can select your preferred reticle out of six pre-loaded variants. Five of them are MOA based reticles and the sixth is MRAD based. You can pick a reticle based on your personal preference or based on the type of shot and environment you’re making. The XT is not completely waterproof. It is water resistant and you don’t have to worry about it getting splashed or wet. It’s not built to be submerged or kept under water. To compare the specifications with the newer, yet more costly, Photon RT series. The RT sensor has a resolution of 768x576 pixels. The XT sensor’s resolution is 656x492 pixels. A higher resolution on the sensor allows for better images on longer ranges. Thus, the RT has a maximum effective range of 220 yards compared to the 130 you have with the XT. The RT, similar to the XT, has six different reticles from which you can choose. 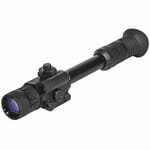 If you’re looking for an affordable night vision scope for up to around 100 yards then this is a great choice. It’ll give you a good image that is sufficient for that range and won’t break the bank. If you can afford a little higher price then go for the Photon RT simply based on the increased effective range.